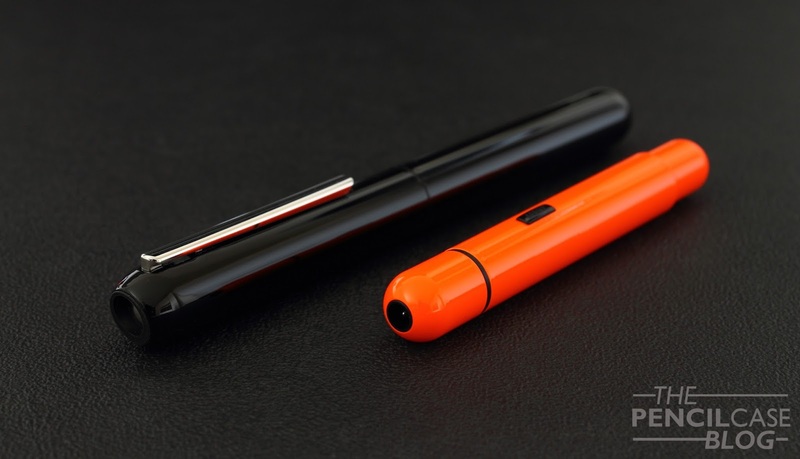 With slight resemblance to something straight out of 2001: A space oddisey, the Lamy Dialog 3 doesn't really look anything like a fountain pen on first sight. But then when you notice it's just another Lamy pen, it all starts to make sense. You see, over the years, we've come to expect unique, minimal design from the German brand. On the other hand, another important part about Lamy pens is their intuïtive and user-friendly functionality. To me, the balanced combination of those two things, makes Lamy one of my favourite brands. In that same point of view, the Dialog 3 is quite fundamentally different from other Lamy products. It seems more focused on aesthetics this time, while taking the functionality 'as is'... or at least that's how it appears to me. Not that it's an unusable, crappy pen. 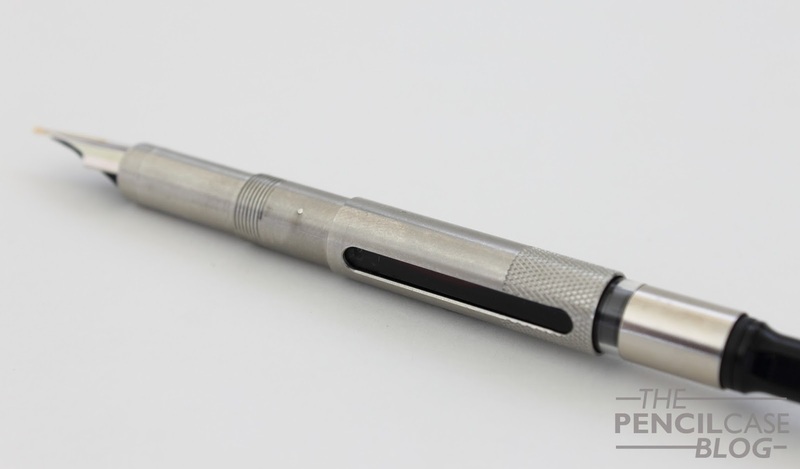 But it's certainly not aimed at being the greatest EDC pen (which will show later in this review). Instead, it shows off with a rad mechanism, and exceptional design. It's not always easy to pinpoint exactly why a minimal design can be appealing. But in this case it obviously has a lot to do with the clean, futuristic appearance of the Dialog 3. The design is definitely 'something else', far from being conventional. In fact, it hardly looks anything like a pen at first glance, which is probably the reason why it doesn't get as much attention as some other pens, the Lamy 2000 for instance. Talking about design: You know how us pen bloggers (it's usually quite a general thing) refer to pretty much every pen's shape as 'cigar-shaped'? Well, the Dialog 3 is probably the closest thing that'll ever come to a true cigar-shaped pen! It has a straight, cillindrical shape without taper, and perfectly round finials. 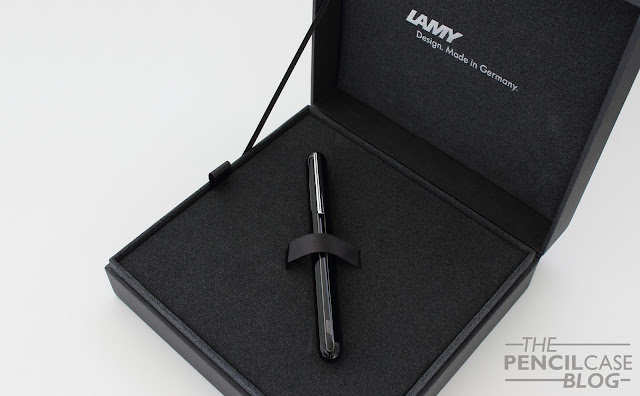 Apart from a clip and two etched parallel lines along the body of the pen (with the Lamy logo in between near the back of the pen), there's literally nothing else. The Piano black finish on the one I have is one of two new versions that were released recently (piano black and piano white). It's a glossy laquer finish that -in my opinion- only makes the modern design of the Dialog stand out even more! A small downside to note, is that the finish is quite prone to scuffs and scratches, so if you're keen on keeping your pens in pristine condition, the matte versions might be a bit more forgiving (although matte finishes also pick up scuffs and scratches with use). But the different finish isn't the only thing new. 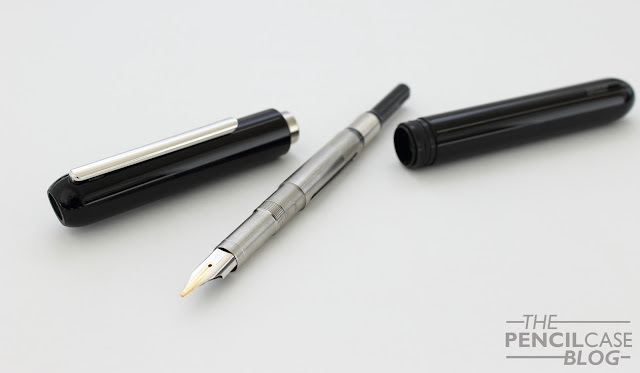 Unlike the older version that was plagued with drying out, the new version (the matte black and paladium version obviously also got an update) has a different internal design, and a slightly different metal nib collar that extends a bit out of the body when the pen is 'open'. These changes, even though they are barely visible, appear to work quite well in my experience. I've had the Dialog 3 for about four months now, always filled on my desk, and it hasn't dried out whatsoever. Even after multiple days of not using the pen, it didn't show the least hesitation and started writing straight away. Lamy has a thing for clips that do a special trick, and the Dialog 3 has exactly that. The clip has the same cigar shape as the rest of the pen, and it sits quite low against the pen body. It's spring loaded and opens up slightly when you push down on the top part. It's not the most functional clip because of the way it is attached, yet it works if you really wish to clip it onto something. The neat part about it comes when you open the pen. 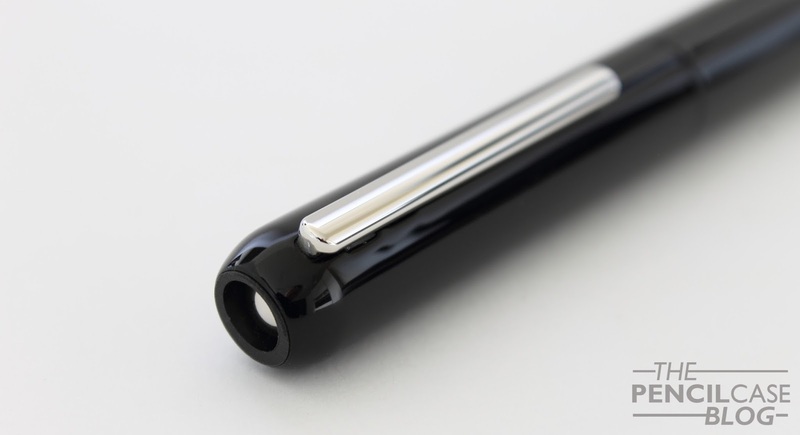 The Dialog 3 is one of the few pens that features a twist mechanism (more on that later), and when you extend the nib, the clip retracts ever so slightly into the barrel, making it harder to clip onto something. It serves as a reminder to close the pen before you put it away. As mentioned, the Dialog 3 uses a pretty nifty twist-action mechanism to extend and retract the nib. 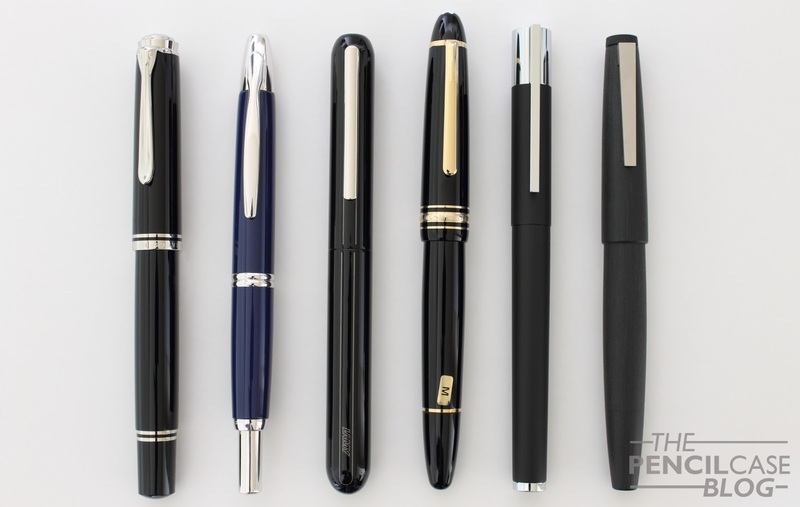 It's among just a few pens that don't use a cap, which leads to unevitable comparison between its closest enemy, the Pilot Vanishing point: The Dialog gets the style points without a doubt, but when it comes to ease of use the VP easily wins. The Pilot VP is made for one hand operation, and it shows that the Dialog 3 is not. It's possible to use the Dialog one-handedly, but it's not that convenient. The Dialog 3 is a solid, robust pen. It's completely metal construction brings the weight up to a pretty massive 45 grams. 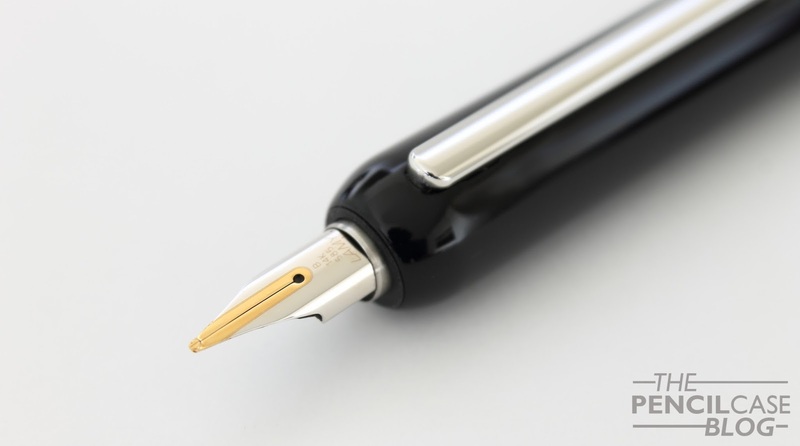 The substantial width (1.3cm/ 0.5in) and length (13.9cm/ 5.5in closed) give the pen a bulky appearance that, together with the weight, gives the impression that you're holding a solid piece of steel! When you 'open' the pen, the Dialog 3 gets even longer, unlike normal pens that get shorter when you take the cap off. With the nib extended, the dialog measures in at 15.6cm (6.14in), which is really long, even for a person like me who likes oversized pens. So does the size make it uncomfortable to use? Well yes and no. 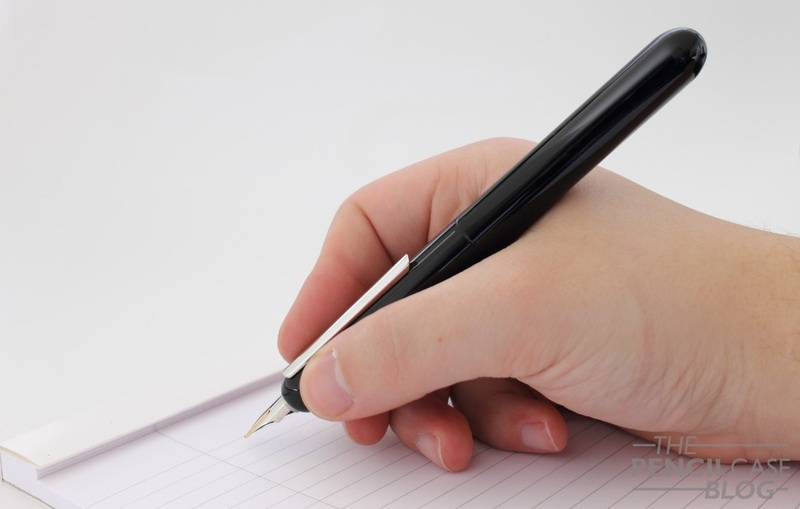 I found myself reaching for different pens when I knew a lot of writing would be involved. But in reality I actually find it more comfortable than the Vanishing point. Due to the larger diameter, the clip, unlike on the VP, doesn't sit in the way, and the weight isn't really a deal breaker in the hand. 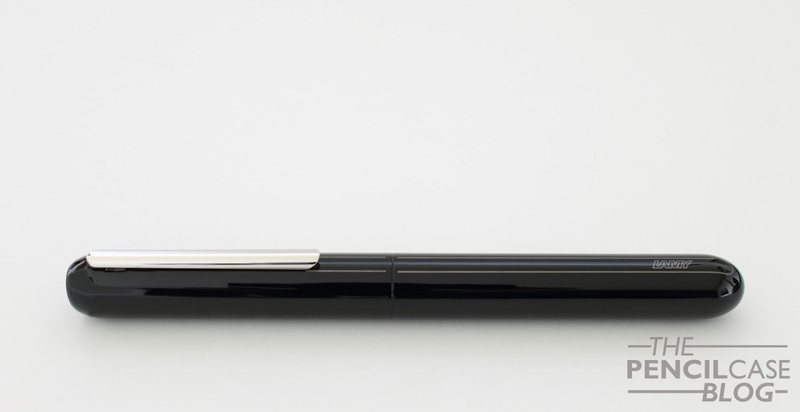 Even though it looks heavy from front to back, most of the weight is situated in the front section of the pen where the mechanism is, so it actually feels quite balanced. That being said, keep in mind that I'm used to writing with oversized pens, so if you usually stick to smaller pens, your mileage may vary. I went with a broad nib (you know me! ), which is actually the first gold Lamy nib -except for the 2000- that I own. It's a wonderful nib, wet and responsive, smooth but not too smooth. Yet same as the nib on the Imporium I reviewed earlier (Lamy Imporium Review), it does tend to prefer wetter inks. With dry inks, it sometimes hesitates and skips a bit, wetter inks solved that problem (I tend to stick to Iroshizuku or Lamy inks). As I said, the new and improved mechanism seems to help in keeping the nib from drying out, so whereas that was a frequent complaint in the past, I think Lamy got rid of it with the redesign. 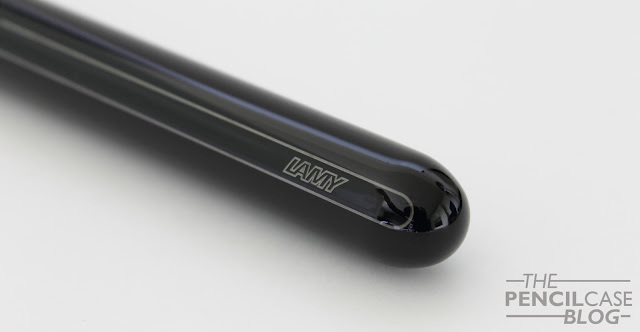 The Lamy Dialog 3 sells for around 310 EUR (305 USD) in the Piano laquer version (a bit less for the matte finishes). That's a lot of money. Especially with the inevitable comparison between this and the Pilot VP, the Dialog might seem a bit pricey. I personally don't care much for the VP, mainly because the design doesn't fit my taste. The Dialog has a great design, which -for me personally- makes it somewhat worth the premium. Really, to be honest, I mainly like the Dialog 3 for its design. As an EDC choice, the VP wins easily. You'll have to decide for yourself what camp you're in: design or practicality! Note: Penworld Supports this blog. I received a discount on this purchase, so I could write this review. I was in no way influenced in the making of this review, the opinions shared here are completely my own! This review does not contain any affilate links. I am in love with the idea of a retractable fountain pen, IMHO a retractable pen is an amazing ideaaa specially for people like me with losing-cap-problems.